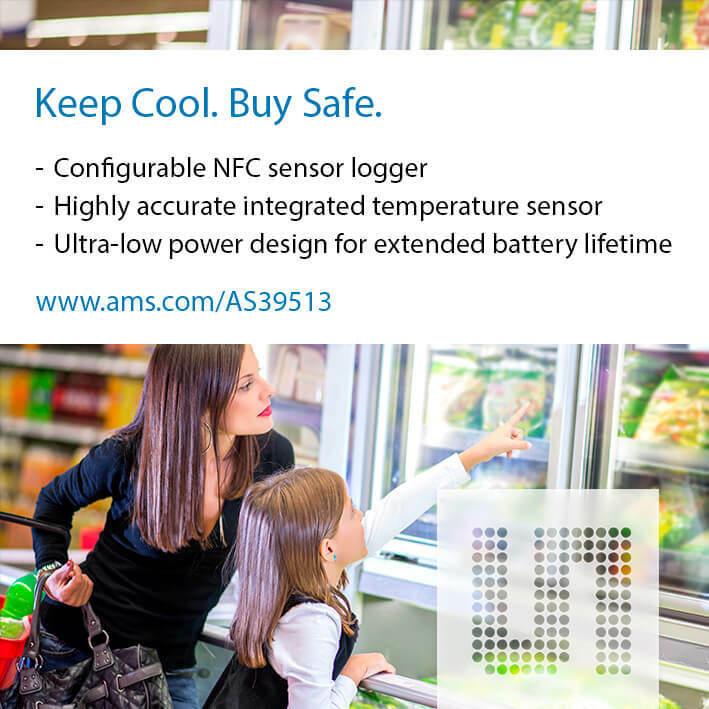 Premstaetten, Austria (13 September, 2017) — ams (SIX: AMS), a leading worldwide supplier of high performance sensor solutions, today introduced the AS39513, an NFC sensor tag and data logger IC for smart labels which enables more efficient and accurate monitoring of the condition of assets such as food, pharmaceuticals and healthcare products in storage and in transit. The new device is a complete digital sensor with an NFC front end can easily be integrated into smart labels. A unique ID as well as logged temperature and other data stored in its internal memory can be read by any authorized NFC reader such as a smartphone or tablet. The new AS39513, which supersedes the ams SL13A sensor tag, has a higher-performance temperature sensor which offers guaranteed accuracy of ±0.5°C in the critical range from -20°C to 20°C, and ±1°C over an extended range from -20°C to 63.5°C. The Cool-Log engine is one of the core innovations in the AS39513 as it offers operational flexibility and ultra-low power consumption without the need for a microcontroller. Drawing just 2µA of stand-by current, the AS39513 can autonomously log temperature data for more than a year on a 30mAh single-cell battery. This superior power performance enables the use of smaller and cheaper batteries, paving the way to farm-to-fork item-level tagging. The chip operates in passive mode and harvests energy from a reader’s incoming RF field, supplying external circuitry with a current of up to 3mA at 1.8V. “In addition, by using modern RFID assembly processes in conjunction with printed electronic batteries, our customers can reduce manufacturing costs and comply with the most stringent regulations for environmental protection, such as RoHS, REACH and EU Directive 2006/66/EC, making smart sensor tags truly disposable and eco-friendly”, he said. The AS39513 is available in production volumes now. Unit pricing is US$1.19 in order quantities of 5,000. A demonstration kit, including an evaluation board and a sample app for devices running on the Android™ operating system, is available from the ams ICdirect online store. For more technical information and to request samples, please go to www.ams.com/AS39513. Actual tag lifetime may vary based on measurement rate, battery chemistry and temperature-related discharge profile.